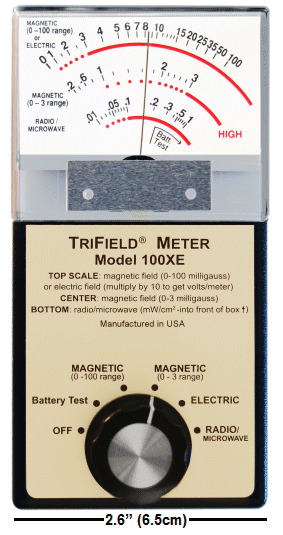 Trifield ® Meter measures all three types of electromagnetic field: AC magnetic field, AC electric field, and radio (including microwaves). The magnetic and electric detectors are 3-axis, making the meter easier to use than comparable 1-axis meter. *The Radio/Microwave section of this meter reads most modern radio sources (50 MHz - 3 GHz). For lower radio frequencies and/or stronger radio sources (such as measuring the field near a transmitter). The Trifield ® Meter is a gaussmeter, electric field meter, radio field strength meter in a single until. When measuring electromagnetic fields (EMF’s), the primary concern is usually magnetic fields, which can be tricky to measure. If a less sophisticated 1-axis gaussmeter is used, a reading of zero could result even where the field is strong. A 1-axis meter must be oriented correctly to measure the field (which is a vector). The 3-axis Trifield Meter solves that problem by measuring the true strength of the field regardless of which way it is oriented. Therefore, the Trifield Meter can be scanned rapidly across an area without having to stop at each point to search for the orientation that gives a maximum reading. Another section of the meter detects AC electric fields, which can exist independently of AC magnetic field. The third section detects radio/microwave, such as from a leaky microwave oven. Detects the three type of electromagnetic pollution: AC magnetic fields, AC electric fields, and radio/microwaves. This is sufficiently sensitive to detect the background field almost anywhere (except for from civilization), while measuring up to very strong AC fields. Analog (needle-type) display has very fast response time compared to digital. (However, AlphaLab also manufactures digital meters). If Interested In MORE Information On EMR & EMF, Then Please CLICK HERE.